Yesterday, I experienced a classic example of a frequent challenge Cyndie and I have been navigating to varying degrees over the 35+ years of our life together as husband and wife. Our minds sometimes tend to operate out of sync from one another, despite our best intentions. It was a beautiful winter day outside, with a lot of blue sky and sunshine, a comfortable temperature, and minimal breezes. We headed out to give Delilah some exercise by letting her run loose in the pastures while throwing discs for her to chase. 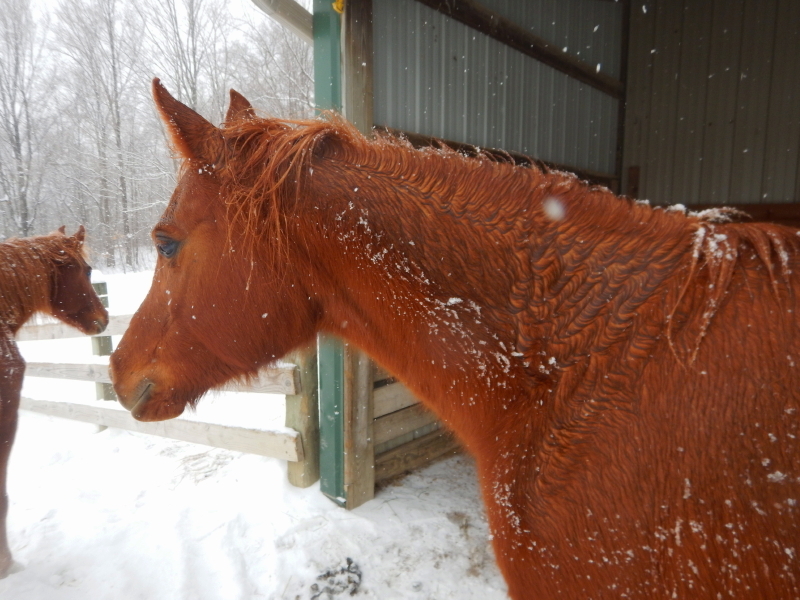 We walked right past the horses, cutting through their paddock to get out into the hay-field. 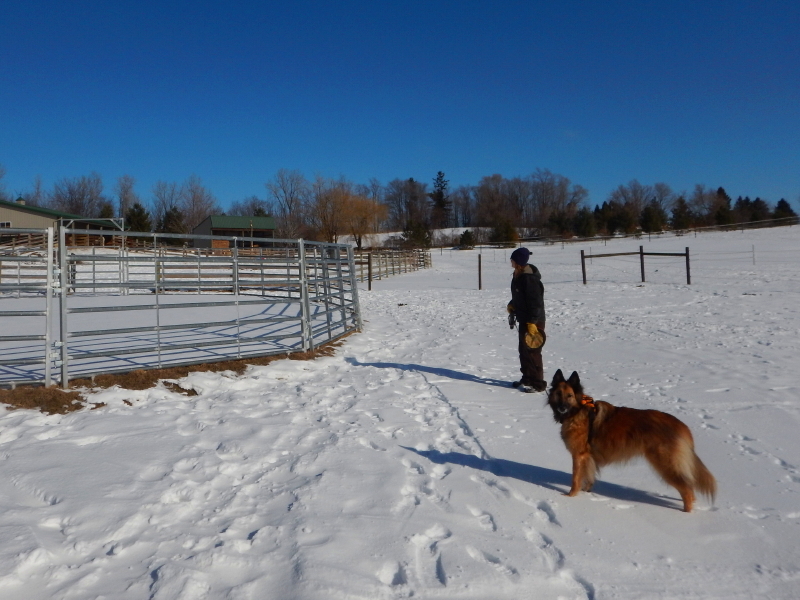 On our way back in, Cyndie said she wanted to pay a little visit to the horses. While milling around with them, Cyndie decided to scoop some of the fresh manure under foot. That inspired me to grab a pitch fork and clean the edges of the large pile we have been creating during the snow season. When she was done cleaning up, Cyndie said she would take Delilah out for one last session of running loose in the back pasture. In a very short time, I was commenting on their quick return. “Delilah’s tired and I’m getting cold, so we are going to head up.” she reported. I told her I would finish what I was doing and then follow them shortly. 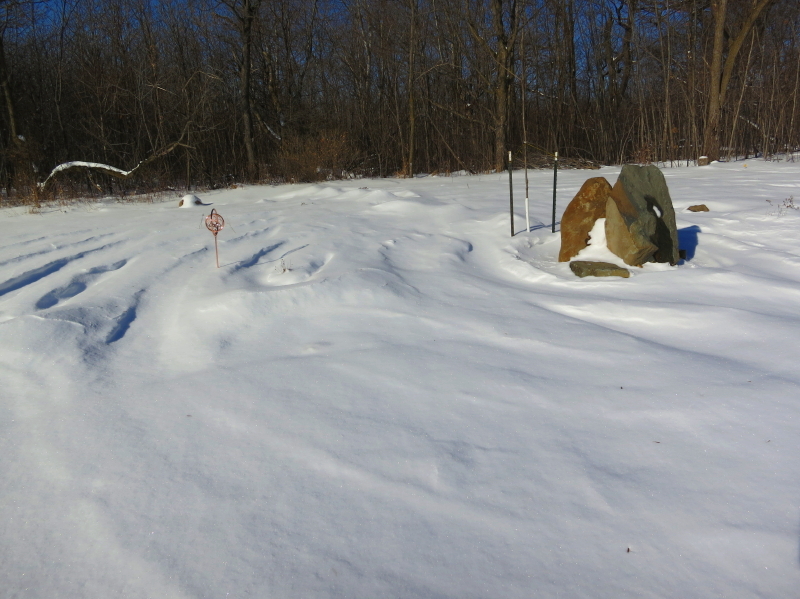 Earlier, Cyndie had asked me what shovel I had used in the past to make a winter path through the labyrinth. 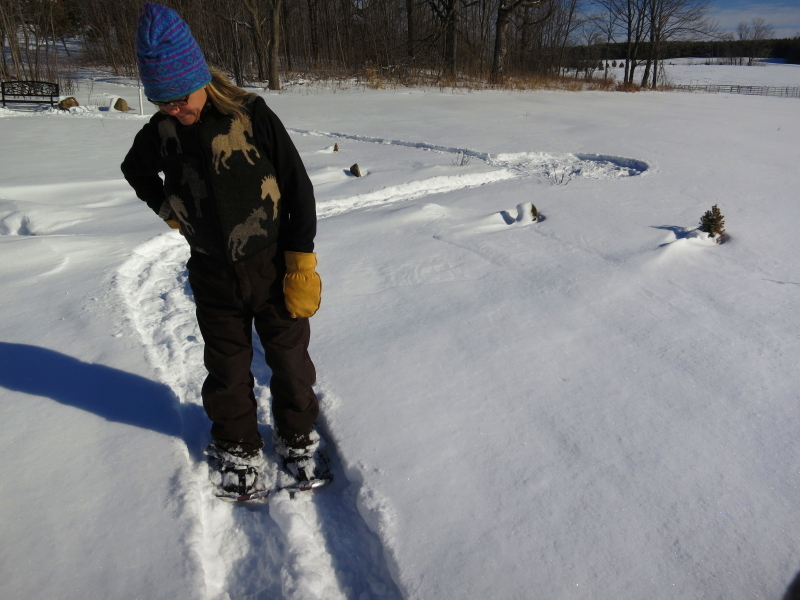 I told her the trick is to just walk the route wearing snowshoes, implying we could do that later in the day, after lunch. As I walked up to the barn to put away my pitch fork, Cayenne turned and approached me for some loving. I soaked up her attention and lingered for what seemed like a long time to me, staying engaged as long as she maintained interest. It’s funny how much hot breath, wet nose, and sloppy tongue seems perfectly acceptable when a horse is choosing to nuzzle and mingle. I searched for a sweet-spot of scratching for her, moving between her ears, neck and chest. Eventually, what ended our little love fest was Legacy, coming over from the other side of the overhang. I don’t know what reason he had to finally interrupt, but I tried spending a little time with him to see if he was just hoping for similar attention. Since he’s not as accommodating to hands-on affection, it comes across more as though he just doesn’t want her to be getting all the fun. I finally made my way up to the house, ready for a break and some lunch. Stepping inside, I found no one there. Cyndie must have gone down to the labyrinth already, I thought to myself. Looking out back, sure enough, I spotted Delilah moving around down there. I rallied my energy and decided to join her. First, I looked in the garage for the snowshoes, but couldn’t find them anywhere. Did we leave the second pair at the lake? Oh well, I’ll grab the plastic shovel, just in case I can find a way to use that to help. The shovel wasn’t where I keep it, either. Frustrated that I couldn’t execute my plan, I walked down empty-handed. I arrived just in time. Cyndie said she needed my help with figuring out where the turns should be. Imagine this, it turned out she had brought down the second pair of snowshoes and the plastic shovel, in case I wandered past on my way up to the house. In response to a suggestion from George about making a trail groomer, I dug out a piece of goat fence and a pallet to see if something that simple might do the trick. Not wanting to leap all the way to the commitment of trying to navigate the 4-wheeler through the deep snow we now have, I decided to test it using my own two feet. The results met my expectations. It can be done on foot, but it was a LOT of effort after the short amount of time when my muscles wore out. In the end I was spending more time stopped for a rest than I was moving forward toward my goal. Using the ATV will be much easier, but I will need to plan to hit the trails early and often in the snow season, to develop and maintain a packed base to drive over. There are a few corners where it will be tricky to negotiate the dragged groomer around trees, and I will need to plot a route that doesn’t involve backing up, but I think I can come up with solutions. 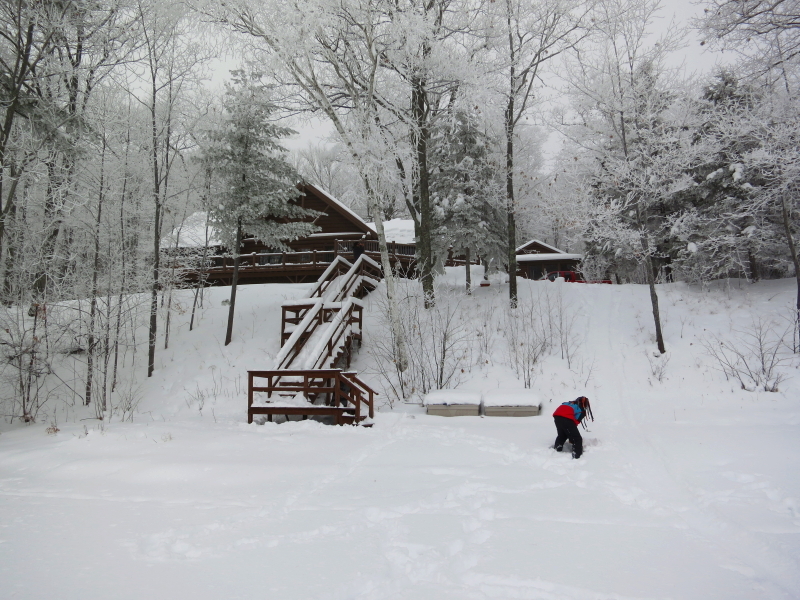 The effort to drag a groomer behind the ATV is different, but not significantly less than the effort of hiking the trails several times on snowshoes. The main advantage of the ATV is that more ground can be covered in less time. However, since I enjoy snowshoe hiking, I find the extra time it takes to walk all our paths multiple times brings me a lot of pleasure. The primary advantage of using snowshoes is ease of mobility. I can quickly and easily make intricate maneuvers to establish paths with sharp turns and short routes. I expect the long-term version of winter trail maintenance will always involve a combination of the two. I envision establishing a perimeter circle that I can easily drive with the ATV, with a few options connecting the labyrinth and the back yard to a couple of the easy trails toward the barn. In addition to that, I will snowshoe the routes from the house to the wood shed and Delilah’s kennel, and a few paths through the woods that are intentionally too narrow for machines to drive through. We should be able to have the best of both versions. The weather of late has been a repeating series of nuisance snow flurries that irk me. We get just enough in the way of accumulating flakes that it makes the place look neglected, but hardly enough to warrant plowing or doing any serious shoveling. A few days ago, it became necessary to clear about 6 feet around the door to the barn, because it was blowing into an accumulation that was twice as deep as what actually fell from the sky. Last weekend I scraped the driveway clean to freshen things up, and then Monday night we collected another inch, just to mess it up again. 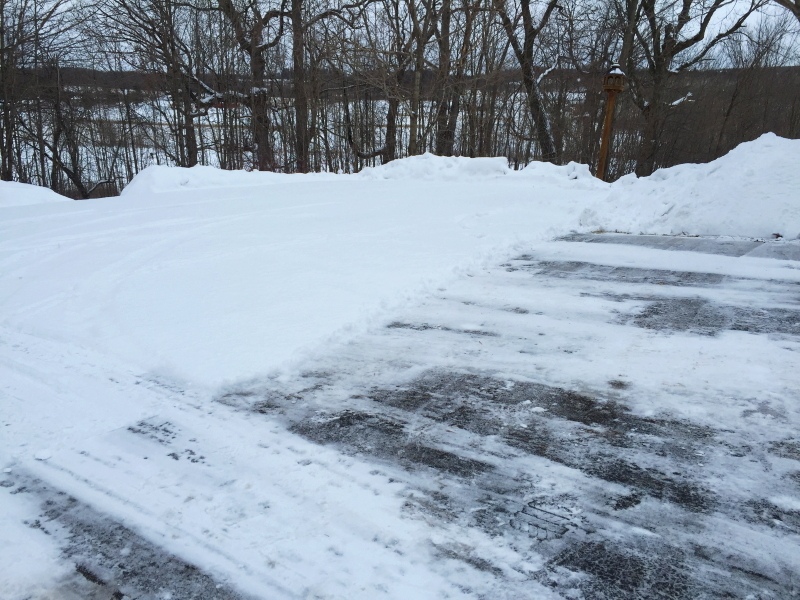 When I got home from work yesterday, it became evident that we received a little more during the day, making it just deep enough that I felt it needed to be plowed. While waiting for a ride to my favorite auto repair shop, I shoveled the sidewalk and cleared snow away from the house to simplify the details for plowing later. I was getting my car back from the shop, where they had changed another sensor in the catalytic converter to get everything working properly again. After walking Delilah and taking care of chores for the horses, then pausing briefly for my dinner, I was ready to do some plowing. 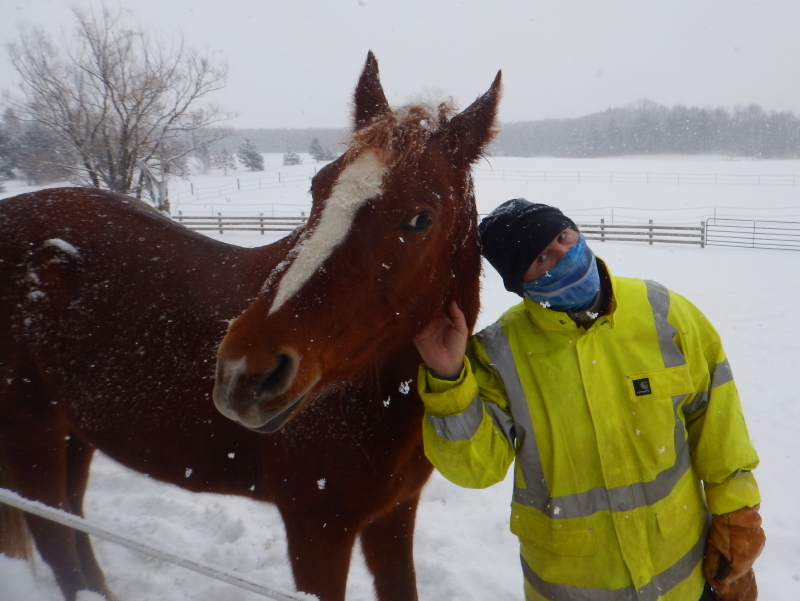 I brought Delilah outside with me and tethered her near the shop while I cleared snow around the building as the ATV warmed up. It was dark, so I couldn’t easily see whether Delilah was happy with her situation, or not, but I decided to plow more than just up and down the driveway a few times. Getting around the barn and hay-shed require a lot more monkeying around than just the straight shot running up and down the driveway. It becomes a series of short distances forward, followed by lifting the plow blade, shifting into reverse, re-establishing a position, and then dropping the blade, shifting back into a forward gear, and repeat. I can do the driveway in about 10-minutes. The rest takes about an hour. I made Delilah wait. It was easy to justify in my mind, because I fully intended to treat her to an extensive walk before we went back into the house. I don’t know whether she sensed it, or not. After parking the ATV, I donned snowshoes and hit the trails with the dog. She immediately set off after what I would guess was the trail of a cat. She was in such a hurry that she almost pulled me over several times when my snowshoe would catch partway through my stride. I’m glad we were doing this in the dark, so nobody could see my awkward stumbling gyrations as I struggled to keep up with our dog in her race after some prowler that was probably already long gone. I tried a little experiment yesterday. I treated the Grizzly like a snow machine and did some trail riding. I had the benefit of some aggressive winter tires that were included in the deal when we bought the used ATV, but the results of my experiment did not ultimately produce results I was hoping to achieve. I was envisioning a wider trail than the skinny packed footprints created by Cyndie when she has been walking Delilah. 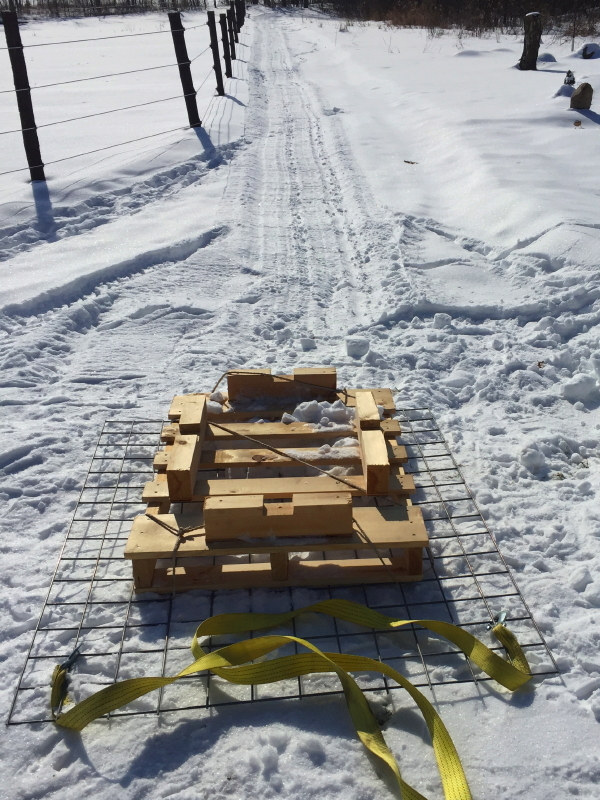 Knowing that I wouldn’t be able to plow the deep snow, because there wasn’t enough traction to overcome the added resistance, I hoped to at least skim off an upper layer while packing down the edges under the wheels. One of the reasons that didn’t work is that the blade would still dig in at times because the terrain isn’t perfectly flat. I had to lift the blade to a point it was rarely skimming any snow at all. That produced a final result of two deep ruts on the outside with a narrow plateau in the middle. It didn’t solve the narrow path issue that annoys me. The best way to get what I want is to purposely trudge the foot trail wider and wider as you go. It is a process that takes time to achieve, although not really all that long if you are walking it 3-times a day with a dog. 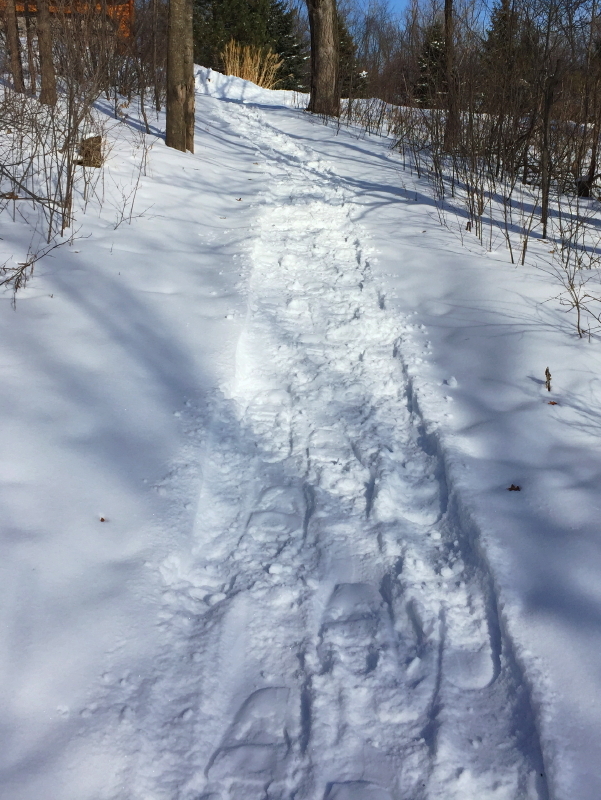 I have taken to putting on snow shoes this weekend, to more quickly widen and pack the main perimeter route, even though that adds unwanted preparation time to the exercise of getting geared up for a simple walk. 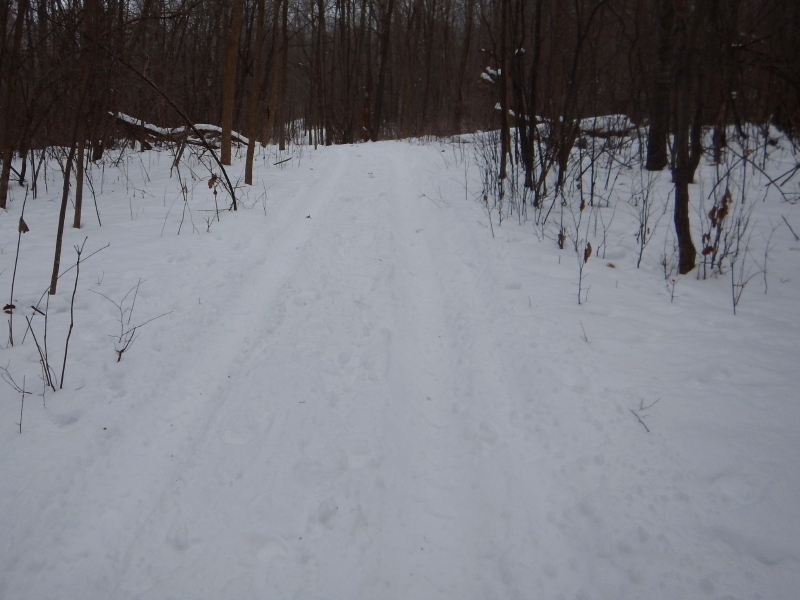 If I was dead set on using the ATV, I could drive the trails over a series of days and make enough progress to plow it down, since the snow will re-freeze each night and provide increasingly better traction for the wheels, but that’s not really what I want. Given a choice, I prefer a human-powered solution, as well as the aesthetic outcome that a foot path through the woods provides. I’m going to keep strapping on the snowshoes for a few days. The weather gives, and the weather takes away. After a couple of days with high winds, limited visibility, and repeated doses of accumulating snow, we received a gift on Sunday of blue sky and warm temperatures. 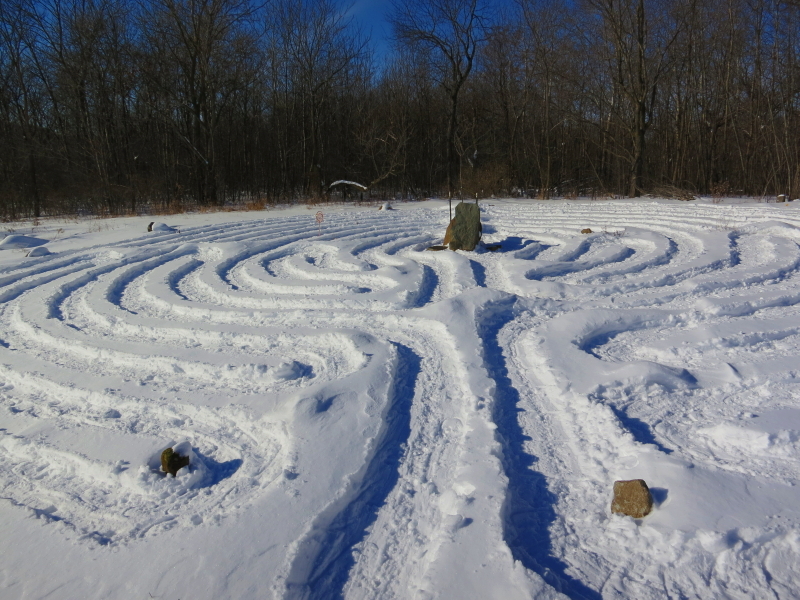 We headed down to the labyrinth to reclaim it from days of blowing snow. I had just walked the labyrinth wearing snowshoes last week, to clearly define the route, but now it was filled in to the point of being difficult to discern. It looked like it had been neglected for most of the winter. I made it most of the way through before finally getting fooled and taking a misstep. Actually, I just went a step too far before making one of the u-turns. 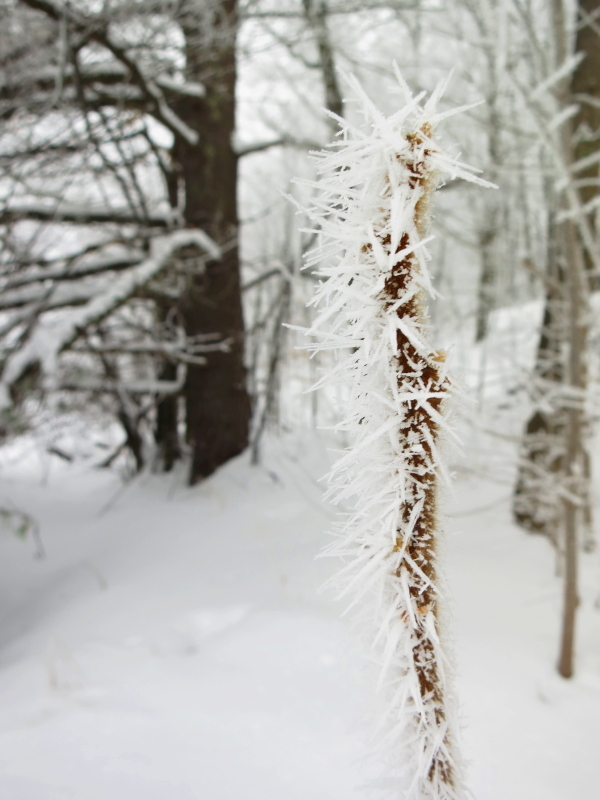 When we started into the effort yesterday, the snow was powdery, but in a very short time it became very sticky. That made our work a bit more taxing, and soon we were shedding layers in the heat of our second January thaw. I hope that doesn’t sound like a complaint. It was magnificent. Yesterday we experienced a perfect northern winter day. We were told that there is more snow up here at our lake place now than this region has received during December in over 20 years. Making the deep snow even more spectacular, it had gotten foggy overnight and the moisture was forming long whisker crystals of ice on every surface. The landscape was flocked in a silvery white sheen. The scenery was storybook perfect. 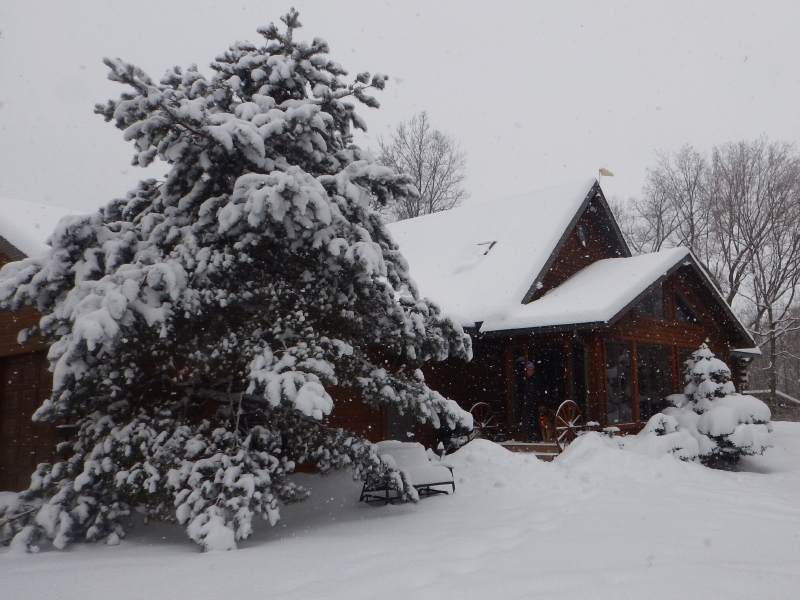 I don’t think we could have provided our guests with a better winter experience than what this weather allowed. The temperature was hovering near the freezing point when we ventured out into the deep snow to play. 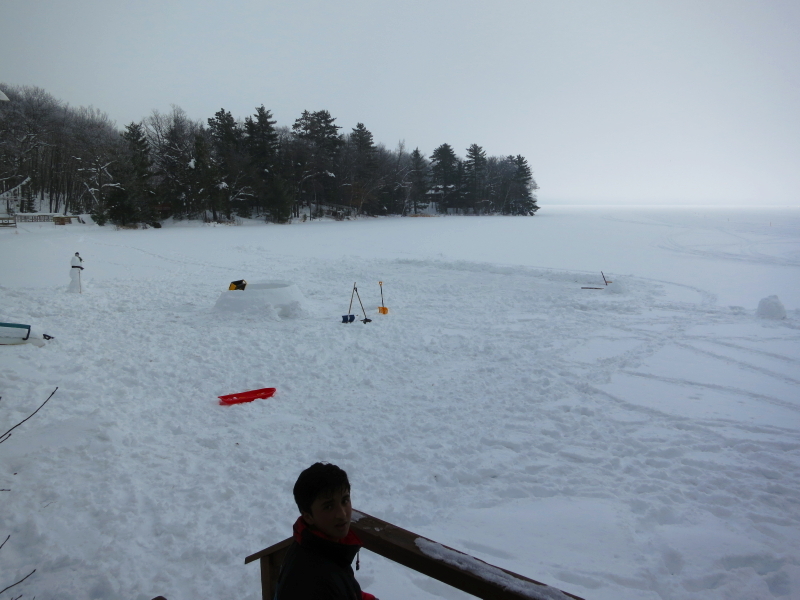 First order of business was creating a sledding path down the hill onto the lake. At the bottom, the boys put a “turn” (what has become our code word for: jump) which worked better and better as the day went on. Then we started work on building an igloo with my framing device. At the same time, shoveling began to create a small rink for boot hockey. Cyndie and Dunia passed by on snowshoes, and after returning from a long adventure, they initiated rolling snow into large boulders. Soon, the classic form of a snowman appeared, adorned with a scarf and carrot nose.